Evaluation: The abilities of the client are assessed in the context of work, school, home, leisure, general lifestyle and family situation. Consultation: Having made an assessment, the Occupational Therapist then talks with the client, other professionals and family members who may be closely involved, in developing a treatment programme. Treatment: Depending on the nature and length of the programme, it may take place in our practice, a hospital ward, residential care facility or at the client’s home, school or workplace. The goal is to maximise the client's skills for living. The goal of hand therapy is to accelerate the patients return to a productive lifestyle, minimising the impact of the injury on work, home and leisure activities. 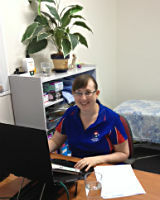 For many years it has been apparent to Cairns OTï¿½s therapists that there is a need for earlier detection and risk reduction education for lymphatic drainage problems that can present following cancer treatment. The Australasian Lymphology Association recommends all people undertaking treatment for cancer have a pre-surgery L-Dex reading taken and circumferential measurements of relevant limbs to achieve optimal long term outcomes. Reviews are recommended every 3-6 months post-op for 2 years and 6-12 monthly thereafter. Lymphoedema is often quote distressing when symptoms first appear and are very unlikely to improve without effective holistic management. Having a swollen limb also increases the likelihood of skin infections such as cellulitis, which if left untreated can create systemic problems, make you very unwell and make the swelling worse. 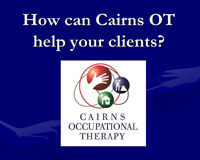 At Cairns Occupational Therapy, we complete a comprehensive initial assessment, taking into account your medical and surgical history, the nature of your swelling and how long your symptoms have been present. We will often work with your GP to create an effective and holistic management plan for your swelling. Improve your arm movement and prevent stiffness and tight muscles affecting your everyday tasks. Improve the appearance of your scars and reduce the impact of your scarring on lymphatic drainage and shoulder movement. Teach you how to improve your lymphatic drainage and reduce your risks of developing chronic oedema / lymphoedema. 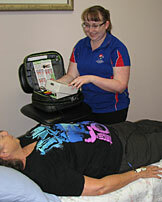 Teach you self-management of lymphoedema via massage, exercises, compression bandaging / garments if necessary. Treatment is often best begun pre-op or in the early weeks following surgery, but can be started at any time. Call to make an appointment. We provide medicolegal assessments and reports for clients undergoing legal proceedings related to their injuries. Our focus is on how the individual’s activities of daily living and roles in life have been affected by the injury. This type of assessment may be performed at our office, within the workplace or at the individual’s home. Recommendations - particularly relating to work, activities of daily living, need for assistance or adaptive equipment / home modifications. Our therapists frequently perform assessments at client's homes for those who have undergone changes in their physical or cognitive abilities from either injury or illness. 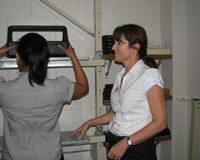 The focus of a home assessment is to increase the client’s independence and safety.